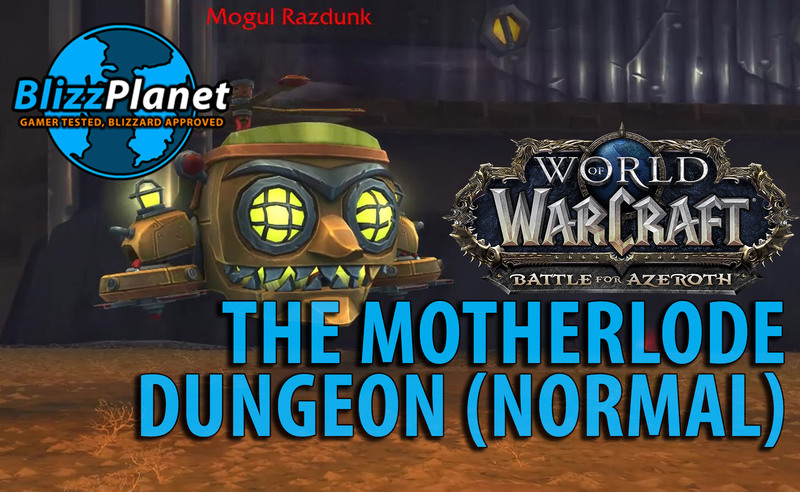 Battle for Azeroth Dungeon: The Motherlode!! The Motherlode!! is a Battle for Azeroth dungeon located in the Isle of Kezan, near the Maelstrom. The Venture Co. has been harvesting Azerite, and according to Daniel Stahl during our PAX East 2018 interview, we will come across the Venture Co. in Island Expeditions as well. The Coin-Operated Crowd Pummeler will launch azerite footbombs near its enemies. Kick these back at the Pummeler, making it more susceptible to damage. Kick azerite footbombs at the Crowd Pummeler to apply Blazing Azerite and prevent the footbombs from damaging your allies. Avoid the Pummeler's Shocking Claw. Prioritize healing any allies who are covered in Blazing Azerite. Keep the Pummeler stationary to enable allies to accurately Punt azerite footbombs. Azerokk's Earthrager allies are dangerous if left uncontrolled, and can inflict heavy damage even to the sturdiest foes. Control them with crowd control or with Fracking Totem as left behind by the Venture Co. Seismologists. Kill Earthragers quickly after they receive Azerite Infusion to minimize the damage they inflict while infused. Run from Earthragers that target you with Raging Gaze, and snare them if possible. Keep Azerokk away from your allies to protect them from one source of Resonant Quake. Overseeing the creation of the Venture Co.'s supply of Agent Azerite, Rixxa is a reknowned chemist and known pyromaniac. Rixxa Fluxflame will spray Agent Azerite at enemies, denying area to her enemies. Propellant Blast will push away piles of Agent Azerite, cleaning up portions of the arena. Maneuver the spray of Agent Azerite to minimize the area it will cover. Direct the spray of Agent Azerite to minimize the area it will cover. Dispell targets affected by Chemical Burn. Maneuver Rixxa away from patches of Agent Azerite and Ignite Fumes. Never able to ascend to Trade Prince, Mogul Razzdunk is certain that becoming the world's foremost Azerite baron will let him bridge the gap. Mogul Razzdunk's azerite-powered war machine can attack players at ground level with guns, as well as from the air with a powerful drill. Lead Homing Missile (12,000/2,500) away from your allies to limit the number of targets it can damage. Stand near Big Red Rocket shells when targeted by Drill Smash so Mogul Razzdunk will damage his own vehicle. Pick up Venture Co. Skyscorchers when they enter the arena when Mogul Razzdunk goes airborne.